"This is a colorful and festive Mexican-style salad. You can use lime juice instead of lemon, if desired." 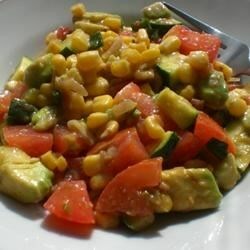 In a large bowl, combine the tomatoes, zucchini, corn, green onions, and avocado. Whisk together the picante sauce, oil, lemon juice, garlic salt, and cumin. toss gently with the vegetables. Chill 3-4 hours, and toss before serving. Ok, but not as good as it sounds. It is more like a garnish or salsa than a salad. loved it! made some for friends and ate in w/ chips and thought it was GREAT!!! I used 2 medium zucchini. It didn't go well at our party last weekend. I agree with the other review that it is more like a relish than a salad. Not a "keeper" as far as I am concerned. I enjoyed this salad. I did add lettuce, carrots and cauliflower. I doubled the dressing recipe and added tortilla chips too. Great summer salad! Wow, this was so delicious! I used a mild southwest salsa in place of the picante sauce, and I cut the oil in half. Good salad and a bit different from the ordinary. Used garlic powder instead of the salt and a few more seasonings. Thank you Christine!